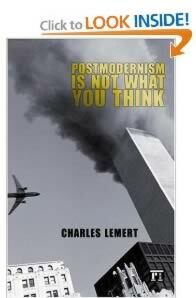 Postmodernism Is Not What You Think by Charles Lemert, 1997. The problem of recuperation is precisely the problem of the retroactive powers of the state(ments); they inscribe the history of the text with the powers of the present. This is why Derrida’s responsible anarchy discloses is covered by the image of the state(ment). We have only to approach the image of the cover, in Lemert’s pro-postmodernism book to establish the legitimacy of this thesis and to thereby refer outside of the so-called anarchy of signifiers, and outside of the text, to the “nothing” that Derrida so favourably described (“there is nothing outside the con/text”). 1997 .. this was a time when so-called post-modernists, Derrida as our exemplar, were bitterly critiquing the works of modernist Marxists such as Habermas (and vice versa), proclaiming Marxism to be the shallow language of the university that one will have to learn to speak without speaking, to speak while secretly overcoming, to master so as to give way to the forces of anarchy in the university. This was a time when it was safe to present a cover of a modernist piece of architecture crumbling to the ground and yet Lemert did not take the opportunity. And has he not been validated by history? 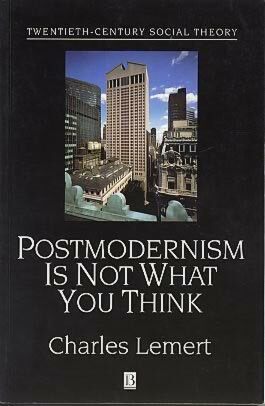 2005 .. the second edition of Postmodernism is not what you think was published. This was a time of rational dialogue between postmodernists and modernists .. a time in which Derrida would overcome the differences he had with Habermas so that they might come together, as one, to speak in a single voice against a shared crisis of faith. When the twin towers of “system” and “lifeworld” come crashing down, we are left with the real terror of postmodernity and we run back to our safe space. Speaking in good conscience, Derrida and Habermas defend the ethical project of the Enlightenment. 2001 … three years before the modern towers came crashing down. The introduction to the book Philosophy in a Time of Terror: Dialogues with Jurgen Habermas and Jacques Derrida (edited by Giovanna Borradori, 2003) explained the significance of this event in no uncertain terms: “This book is the first occasion in which Habermas and Derrida have agreed to appear side by side, responding to a similar sequence of questions in a parallel manner.” 2003 .. one “event”, an “event” that changed everything. Badiou would have us believe that through the witnessing of this rupture, in its (cover-)image, a the smooth ideology of the subject is puntured and s(he) is able to come into being by recognizing the dark face of truth. But here do we not experience precisely the opposite? The rupture of the smooth functioning of the system will always be sutured by the symbolic network of signifiers, the event terrorizes us, frightens us into submission, and we retreat back to a safe time, back to a safe place. The statist logic of modernity thereby is thereby renewed. .. Derrida and Habermas appear to us as the Knights of Good Conscience. 1997 .. 2005 … irony is at play between the two cover images. Whereas the archi-ecriture of the first cover reflects a time of modernity, while the book stands alone in defending the claims of post-modernism, the latter cover reflects a crisis of modernity at the hands of post-modernity: the twin towers of system and lifeworld are crashing to the ground. In a time of hope, Lemert has mocked us. In a time of fear, Lemert has frightened us. Finally, a book that goes all the way. I had the honour and good fortune of listening to Charles Lemert speak at the W.C. Desmond Pacey Memorial Lecture at the University of New Brunswick. He shook the audience up with his words, provoking them. When they offered him looks of disgust, he disgusted them further. He stood unmoved by any of it, firmly in place. He spoke about the importance of coming to terms with death and stood like a corpse in front of an audience with dieing interest. After the lecture there was only one question and it was posed as such: “I respect you, Mr. Lemert, as a learned individual, and I respect that you are on the stage up there and that I am not, but all the same I wonder how you can go about spreading this theory of post-modernism and death and to thereby steal all the hope from our children?” The passionate interlocutor stood there with tears in his eyes as if to beg for mercy. Even I wanted to tell him what he wanted to hear, knowing very well he wouldn’t believe it anyway. Clearly, the interlocutor had not come prepared to engage with Mr. Lemert nor had he spent any time researching the thesis of his book. A new thesis, rarely refuted, now dawns upon me: postmodernism is “the ability to drive people crazy, even to distraction.” This is what good post-modern philosophy does to people: it obfuscates and distracts them from the smooth functioning of their everyday lives, drawing them into new ambiences, new experiences, new ways of knowing and being. It does not do this by driving a plane into a giant piece of modern architecture, .. there is no reason to waste it all, to hurt so many people, on a strategy that won’t work anyway. But so long as I am alive, and so long as I know the error of the hysterics discourse, I speak through it from some other place of being. Imagine. Should one find oneself in the uncomfortable position of being a sociologist in the academy as well as an anarchist, a business owner and a radical, .. a baseball player and a freak; one nonetheless crucifies those who do the same. Let me reverse. Imagine. One should find oneself in the uncomfortable position of being an anarchist while also being prepared to be sacrificed to and alienated from the milieu for breaking the ethical codes that motivate the tradition, even while one believes these codes more dogmatically than most. Dare I say it? Having said it, I fear, I have already sacrificed too much. Lemert’s quick on-point anecdotes were captivating. One such story described an incident in which a non-tenured junior colleague of sociology was carefully instructed that his/her department “so hate[d] postmodernism as to [have the individual stand] no chance of promotion should they be seen in its company.” It could similarly be stated as the case for any student of sociology, such as myself, who, after having searched through the archives of radical thought and, after finally exhausting the possibilities as to how to define the present crisis—of which it might well be impossible to doubt—to have finally stumbled upon a body of literature in nihilist anarchism, now finding herself having to defend such an audacious proposal! There is no defence! While reading this book, memories of undergraduate sociology courses vividly haunted me. I recall one debate that lasted for at least two classes in which a professor attempted to convince me that her department was more radical because it was not falling into the popular trap that so many other departments had become victim to: namely, the teach postmodern philosophy. But where does one go, in the university, to learn postmodern philosophy? Surely not Queen’s University. The book is clearly written and surprisingly comprehensive: including, among several personal stories (even one reprinted love-note), well thought-out and cleverly focused treatments of Saussare, Derrida, Foucault, Debord, Mauss, Durkheim, Simmel, Strauss, Weber, Baudrillard, Lacan, Sivak, Habermas (who, I remember Lemert repetitively denouncing at the bar while we shared a few drinks), Barthes, Said, Rorty, Marcuse, Lyotard, Kristeva, Merton, Mills, Mead, Parsons, among many others. If one can move beyond Lemert’s naive retracing of the New Social Movements (a residue of the modern project) and his seemingly celebratory treatment of identity politics, the book is sure to be a good companion for any radical interested in understanding post-modernism and post-modernity from an academic who writes outside of the language of the university. Perhaps there is something to this postmodernism thing after all. Whether one likes the term or not, one certainly has to admit that, as Lemert puts it, “something powerful, deep, and potentially far-reaching is going on [and this] seems to . . be beyond doubt.” A few interesting distinctions are made which are worth repeating. One of which is the difference between social theory and sociological theory. While the former is characterized by a critical attitude in the face of social life, the latter invokes a purely scientific methodology. Lemert is able to trace, not unlike many other contemporary sociologists, critical, even moral, impulses in such sociological figures as Durkheim, among others. It is this critical impulse that gives Lemert the academic force he needs to advance a case towards critically engaging with theories of the postmodern. Lemert is clearly a social theorist, he is not therefore a sociologist. Another interesting distinction is made between what Lemert calls “radical modernism”, “radical postmodernism”, and “strategic postmodernism”. To put the matter simply: radical modernism is best explicated by Habermas’s defence of enlightenment subjectivity (the self-knowing subject), as can also be found in many of the Frankfurt school thinkers. Thus, one can sense, if not explicitly mark in the pages of such thinkers as Marcuse, the wanting to break away from the ‘iron-cage’ that Weber so dreadfully referred to. Radical postmodernism, as to be expected, is best explicated by Baudrillard and, to some degree, advanced earlier by the Situationists, for such thinkers the current situation is characterized not by the linearity and the reality of the past, but by hyperreality of the present. Strategic postmodernism, more cautious than full postmodernism and more critical than naive radical modernism, is interested in rewriting the history of modernity. From a lonely, dark, apartment, such ends my one day encounter with Charles Lemert and the dreadfully depressing postmodernism he contends sociologists must be forced to think through. Though one might be in fear of that which is new, critical, and exciting, if one wants to invoke any sort of epistemological rupture, insurrection even, one must take, as Lemert puts it, ‘the mind of the fearless amateur’ — one who is not afraid to not know, to experiment with ugly and dirty ideas, and to face that which is unable to be explained (that which is impossible). Otherwise, one is faced with the likes of anarchism and its loyal servants who, on fear of having to contend with thoughts which bring power and responsibility closer to home, send out hostile emails, protesting the “dangerous” and decidedly infectious postmodernisms, post-lefts, and primitivists, and defending the even more dangerous and totalizing notions of progress, purity, social movements, and popularity.